This entry was posted in Public Relations on September 8, 2015 by Kathryn. Millennials connect with nonprofits who provide quality information via mobile devices, websites. social media and emails. Gen Y responds best to a multi-channel marketing strategy. 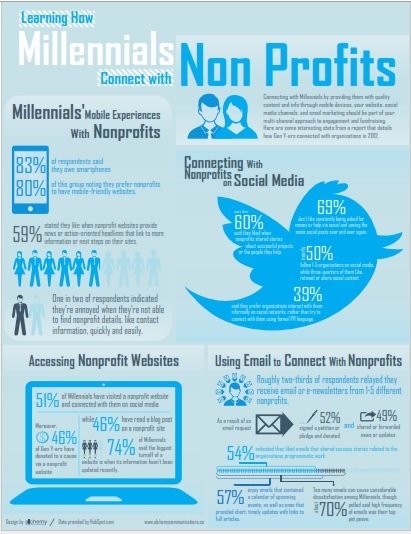 These stats on how millennials connect with nonprofit organizations will help you understand how to approach Gen Y for fundraising and support. author: K athryn Bechthold, Communications expert in Calgary, AB. Owner/CEO of Alchemy Communications Inc. This entry was posted in Corporate Videos and Infographics, NonProfit Communications and tagged Gen Y, millennials, millennials and nonprofits on August 26, 2015 by Kathryn. Knowing how Gen Y-ers get involved with non-profits is vital to the success and growth of nonprofit organizations. Numerous millennials may want to get involved with your organization: you need to give them the opportunity and make it worth their while. These stats on millennial giving can help you understand what lights their fire, and what causes millennials not to get involved with an organization. This entry was posted in Corporate Videos and Infographics, NonProfit Communications and tagged millennials, nonprofit organizations on August 20, 2015 by Kathryn. Many professionals create a LinkedIn profile, and then let it sit there. Unlike many other popular social networks, LinkedIn is designed for professional and business networking. If you want your LinkedIn page to work for you, invest some time in setting up a professional LinkedIn profile to increase your visibility and invite your target audience to connect with you. Then, use your LinkedIn page to grow your brand and build relationships. Your LinkedIn Profile is the header information on your LinkedIn page. Having the wrong LinkedIn profile sends out the wrong message. Maximize your LinkedIn branding by designing a profile that delivers your message. Your profile photo is your 1st impression: LinkedIn users respond to professional, not necessarily formal, profile photos. LinkedIn is not the place for your photo holding your cute kitty: unless you’re a vet. Family photos are better suited for Facebook and other social channels. Complete your profile: don’t leave blanks in LinkedIn’s prime real estate. If you don’t have something to say about yourself, you need to determine what are you trying to accomplish on LinkedIn. Keywords are critical to quickly saying who you are and what you do: be descriptive, not a bragger. tip: Choose View Profile As to see what your LinkedIn profile looks like to a connection or to the public. Include a call to action: what do you want the reader to do? LinkedIn users evaluate you based on who you connect with. Find people you want to build relationships with: who you want to follow and exchange ideas with. Personalize your invitation to connect: do you want to be branded as a spammer? Why do you want to connect? Do you share common LI groups? Are you in the same industry? Are you a fan of their articles? Know why you’re connecting. The number of your connections shows in your profile: while 500+ looks impressive, 100 good connections that build your business will be more effective than 500 strangers you don’t learn from, and you spend time scrolling past. Join LinkedIn groups in your industry or your target audience. Your groups show up at the bottom of your LinkedIn page. Contribute high-quality articles to LinkedIn Pulse, LinkedIn’s publishing platform. Share Slideshare posts on LinkedIn and add relevant SlideShares to your LI profile. Regularly post status updates, comment and share on your connection’s updates, and contribute to group discussions. Your posts and comments influence your ranking on LinkedIn, and increase your online visibility. Share your blogs, guest posts, interviews and other relevant authorships. Curate industry topics and add insightful comments and post in updates or in your groups. LinkedIn is a powerful tool to build your personal brand. Basic LinkedIn is available for free, and LinkedIn for Business has paid options to grow your business including relationship management tools and advertising. The first steps to building your brand on LinkedIn is to optimize your profile and engage with your audience. Follow Alchemy on LinkedIn: Alchemy Communications Inc. This entry was posted in Content Development, Public Relations, Social Media and tagged LinkedIn on August 12, 2015 by Kathryn. Digital media has added many opportunities to be interviewed and deliver your message to your target audience. Both interview pros and newcomers can easily be tripped-up by the interview process. Media and PR expert Kathryn Bechthold has personally given hundreds of media interviews, and trains her clients to avoid making common media interview mistakes. You are being interviewed to talk about a specific topic because your interviewer has researched for an expert on a specific topic, or because you have been pitching your story to the media to get coverage for your new project. You need to create a key message for this interview. A key message is the most important thing you want your audience to remember after the interview. Your key message should be clearly understood and not use industry jargon. Your job is to prepare for the interview by creating your key message in advance, and practice delivering before the actual interview. 1. Consult with a communications professional – either in your own company, organization, or agency – or with an external firm, preferably one with crisis communications capabilities. You may be unaware of the landmines that exist in your specific case. 2. Consider your relationship with the reporter. Journalists you know well and who have treated you fairly for several years are generally safer risks than reporters you are working with for the first time. 3. Ask the reporter to define exactly what off-the-record means to him or her, preferably in writing. 4. Make any agreements with a reporter in advance of the interview. You can’t say something interesting and then suddenly declare it off the record. Regardless of any agreement you make, you may still be identified by name as the source. Therefore, the most prudent advice is to remain on-the-record at all times. Even if your name isn’t used, the words a reporter uses to describe your position may make your identity perfectly clear. Unless you’re fully prepared to take that risk, don’t ever speak off-the-record. In your eagerness to deliver your message to your audience, be careful not to cut the interviewer off before they complete their question. You may be anticipating the wrong question – and give the wrong answer; and you may offend the interviewer and make them hostile to your message. Always listen carefully to the media’s question before you deliver your response. TIP: Congratulations: your pitch worked, and you have an interview with a journalist – now what? 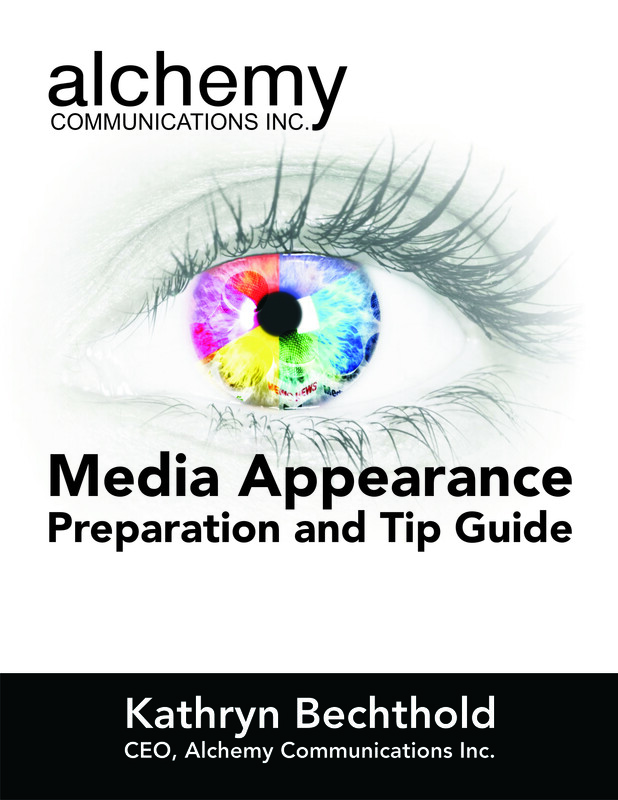 Download our free ebook: Media Appearance Preparation and Tip Guide filled with PR pro Kathryn Bechthold’s expert advice for media interviews. This entry was posted in Press Releases and Media Relations, Public Relations and tagged media blunders, media training on August 6, 2015 by Kathryn. Are you trying to build a following on Instagram? Instagram is the most visual platform on social media: with an active, engaged community. Don’t be afraid to experiment on Instagram: if it doesn’t work, try something different next time. If you’re new to Instagram or trying to grow your community, here are some Instagram strategies for your next PR campaign that are proven to work, from the smart folks at KISSmetrics. Your followers will see your posts – so post often! So post more photos than videos, but mix it up! Experiment with different colors of background and text to see what colors your audience responds to. Filters are fun to design creative photos – but if filters lessen your engagement, don’t use them! Highest Instagram engagement by day of week is close: it only varied from a high of 4.9% to 4.4% on the lowest day. But to get the biggest bang from your post, try Wednesday! Understand the psychological influence of colors on your audience so you can optimize your visuals for maximum engagement. With an engagement rate of only 4.4%, Monday has the lowest engagement rate on Instagram. But its only .5% behind the highest day, Wednesday. So your posts get equal visibility as accounts with larger audiences – there’s no bias for bigger brands. Post when your target audience is on Instagram! But if your audience is active on Instagram at midnight, and you’re sleeping, we’re a fan of Onlypult to schedule Instagram posts. This entry was posted in Public Relations, Social Media and tagged Instagram on July 29, 2015 by Kathryn. Since Google’s mobile-friendly update, mobile traffic is down 10-12% for businesses that have not made their website mobile-friendly. Alchemy PR shared the upcoming Google changes to its search algorithm that provides businesses with mobile-friendly websites higher rankings in mobile search. Google also did something unusual: they announced the update well in advance to encourage business owners to make their website mobile-friendly and easier to upload and use on smaller, mobile devices. Google also provides a free tool to check if your site is mobile-friendly: see if your website is mobile-friendly here. Mobile-friendly design is called responsive design, meaning the website is easy to read and navigate on different platforms including mobile phones and tablets. Recently Microsoft announced that Bing has also made changes to their search algorithm to favor mobile-friendly sites. According to USAToday, “proof that those warnings were legitimate came in the form of a new report from Adobe that said firms that didn’t update saw 10% of their mobile traffic disappear year-over-year.” Adobe’s report reached this conclusion by monitoring over 489 billion ad impressions on Google, Bing, Yahoo and other websites. Bloomberg reports businesses saw up to a 12% decrease in traffic in the 2 months after the Google update; and that according to US Small Business Administration over 90% of small business websites are not mobile-friendly. Can Your Business Afford to Lose over 10% of Mobile Traffic? You built a website and a blog to help people find your business online. If your website is not mobile-friendly, you are losing traffic and money because search engines are not showing your business in results. This entry was posted in Mobile Marketing, Public Relations, Small Business and tagged #mobilegeddon, mobile-friendly on July 22, 2015 by Kathryn.